Figure 18.14. Utility of IgA HLC for monitoring IgA MM. (A) IFE became negative when an abnormal IgAκ/IgAλ HLC ratio indicated residual disease. The HLC ratio became normal with further follow up. (B) IFE and the IgAκ/IgAλ HLC ratio became normal at the same time, but on subsequent follow up, IgA HLC ratio became abnormal, indicating relapse when IFE was still normal. (Reprinted by permission from Macmillan Publishers Ltd: Leukemia , copyright 2013). Ludwig et al. reported three MM patients in whom a HLC abnormality pointed to imminent relapse while IFE was still negative. Data from one of the three patients is shown in Figure 18.14. Following induction therapy, the patient with IgAκ MM initially achieved a CR and the IgAκ/IgAλ HLC ratio was normal . Seven months later, the HLC ratio became abnormal due to pair-suppression of IgAλ (IgAκ was still within the normal range). 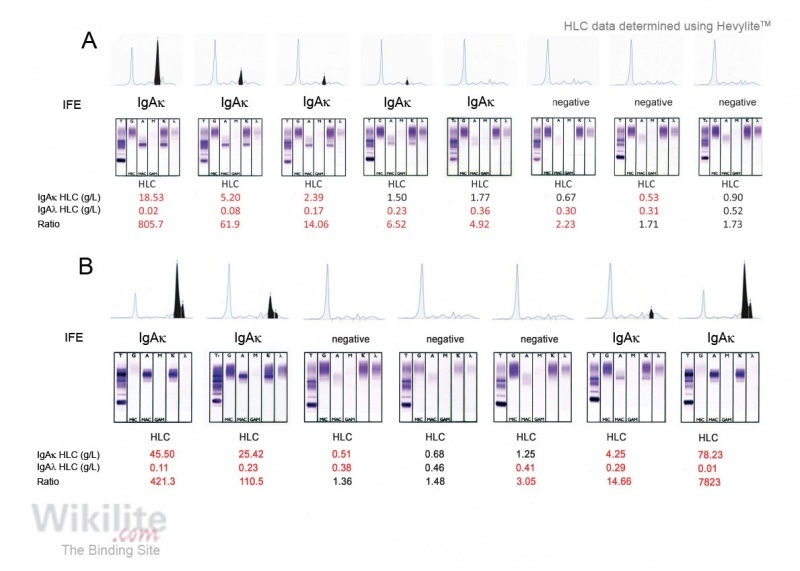 Subsequently, IgAκ became elevated, with further reductions in the uninvolved HLC pair, confirming disease evolution. IFE became positive 5.5 months after the HLC ratio became abnormal. It is noteworthy that, although the κ/λ sFLC ratio was abnormal in this patient at diagnosis, it normalised following treatment and remained normal at relapse. This highlights the importance of measuring both FLCs and intact immunoglobulins during follow-up. Chae et al. also reported two MM patients that were considered to have complete response (with a normal SPE, sIFE and κ/λ sFLC ratio), but an abnormal HLC ratio indicated relapse 1.5 and 3 months earlier than sIFE became positive. As such, the HLC ratio was an early indicator of relapse. Other examples where abnormal HLC ratios or increasing dHLC values have provided an early indication of relapse have been published elsewhere . Bradwell et al. reported on 5 IgG MM patients who achieved a CR by IFE with normalisation of the IgGκ/IgGλ HLC ratio. In 3 of 5 patients, subsequent relapse was indicated earlier by abnormal HLC ratios. In an IgA patient, abnormal HLC ratios indicated a slow relapse more than a year before IFE became positive.